With the price of crude going sideways, the local fuel prices are mirroring similar stability. It would be nice if the price of fuel would go down, but most likely not going to happen on the Obama’s watch. According to a recent Heritage Foundation Report, “if the President was serious about bringing down the cost of gas, he would instruct his Administration to reduce the bureaucratic red tape on energy projects in the Gulf of Mexico. A new report from Greater New Orleans Inc.revealed that the issuance of drilling permits is down 71 percent compared to the monthly average over the past three years. … Worse still is the news that the Department of the Interior might let hundreds of Gulf of Mexico drilling leases expire, costing jobs and further decreasing production. Makes you wonder what the bloviator in chief at the California Air Resources Board (CARB), Mary Nichols is going to do with their much ballyhooed (but delayed) idea of carbon trading in California? CA is still in a depression and the environmentalist are more worried that we are not meeting the goals set out in AB-32 the Global Warming Solutions Act of 2006, then crating jobs. Never mind, they there has not been any significant warming for the last 15 years and in Sacramento, the source of AB32, for the last 30 years. California is not on track to meet the most ambitious goals of AB 32, the state’s Global Warming Solutions Act of 2006, according to Carl Blumstein, director of the California Institute for Energy and the Environment. “It’s very challenging,” said Blumstein, addressing an August 4 event at the University of California Sacramento Center. Blumstein did not challenge any part of AB 32, which calls for reductions in greenhouse gasses (GHG) by 80 percent from 1990 levels by the year 2050. But Blumstein said that “we are not on course” to meet the 80 percent goal for 2050. The goal for 2012 is 20 percent. According to the California Energy Commission, as of 2010 natural gas accounts for 41.8 percent of state energy, with nuclear power 13.9 percent, unspecified 12 percent, large hydro 10.7 percent and coal 7.7 percent. Renewable sources amount to 13.7 percent of state energy. Solar power accounts for only 0.03 percent of that amount. California must “confront climate change,” said Blumstein, who did not indicate whether all scientists agree that climate change means inexorable warming by human agency, to be remedied by government regulation. He did not refer to 30-year data on temperatures, which show cooling in the Sacramento area. Read the rest of the story here. I agree, that California needs to “confront climate change” but we need to ask, what happens if the cooling trend continues. Reputable scientists. in peer reviewed papers, have said the sun is going into a long slumber, and when that has happened in the past the planet has cooled, for 30 to 70 years. Past cooling has a huge impact on agriculture and millions starved. What happens to California agriculture, which is a major part of the states economy, if the cooling continues? Should we be preparing for cooling and not warming, that is what the real world data is telling us, but our political leaders are looking for problems elsewhere. The current turmoil in the stock market has resulted in a drop in crude prices, but we have yet to see any drop in gas and diesel prices. They are now stable, with the average prices about $1.00 more per gallon at this time last year. When crude is on an upward spiral, the retailers are quick to raise the price of fuel, but when they are on the down side they are much slower to adjust the price. Why, you ask? They lose some profits on the upward spiral and try to regain their losses on the down slope. If crude continues to stay low, there will be some profit taking before we see any slide in prices. Last week President Obama announced a mandate forcing automakers to boost new-car fuel economy standards from 35.5 mpg in 2016 to 54.5 mpg in 2025. He claimed the new standards will save Americans $1.7 trillion over the lifetime of vehicles and $8,000 per vehicle by 2025. Really? The Center for Automotive Research (CAR) has taken a look at the numbers. There are two ways to increase vehicle miles per gallon, reduce weight by 15% to 30% or add technology. Reducing weight and size reduces vehicle safety, increasing technology increase the cost of a vehicle. The most likely car company solution will be to increase technology, as reducing safety is not a good marketing strategy. Long term, citizens will hang on to their existing vehicles, buying fewer of these government mandated vehicles. The cost impact will be even higher in California with the $5.00 a gallon gas resulting from CARB’s mandated low carbon fuel starting in 2012. CARB is determined to destroy the California economy with their hair brained regulations one gallon at a time. Cost of CARB: Mary Nichols on new CAFE Rules - Fuel prices continue to rise. CARB's Mary Nichols has been commenting on the new CAFE rules proposed by the President. KQED's Climate Watch has the details on the new CAFE standards here. Let's see, California has the second highest unemployment in the nation, with thousands of our best and brightest escaping the economic misery and the loss of freedom in the state, and our bureaucrats are proud to be part of a scam to keill more jobs in California. NASA is one of the world's leading scientific agencies, yet they have refused to use their own scientific data to correct their global warming computer models at NASA/GISS. Why? James Taylor writes is Forbes Magazine: New NASA Data Blow Gaping Hole In Global Warming Alarmism. The real question is does scientific debate really matter? Using those unscientific NASA computer models, aided by a cooperative press, multiple government funded environmental organizations have convinced Californian's that global warming is real, a clear and present danger to their public health. A small minority have impressed their wacko science on the majority. See Rebane's Ruminations for more on the minority tipping point. The latest Public Policy Institute of California study, Californians & the Environment found that most California's support the states climate change policy. Diesel prices are continuing to rise. Exit Question: Why are the US gas prices catching up with California? Gas prices in Nevada County and CA showed a slight decline, while US gas prices increased two weeks in a row. Diesel prices across the nation are going up and in CA, but Nevada County is showing a slight decline. Crude oil is also showing a very slight increase, essentially flat. With each passing week the charts look more chaotic. Earlier in the year they prices were in synce, and now they are all over the map, and I have no explanation. Please comment if you have any ideas? Ellen and I have just completed a coast of coast cross county trip in our GMC 2500, which burns diesel. Ellen kept track of our fuel usage and the prices. The lowest diesel price we saw on the trip was $3.44 some where in the mid-west. I will have more details next week on the exact location on of the lowest and highest prices. We arrived home yesterday and are still in recovery mode. 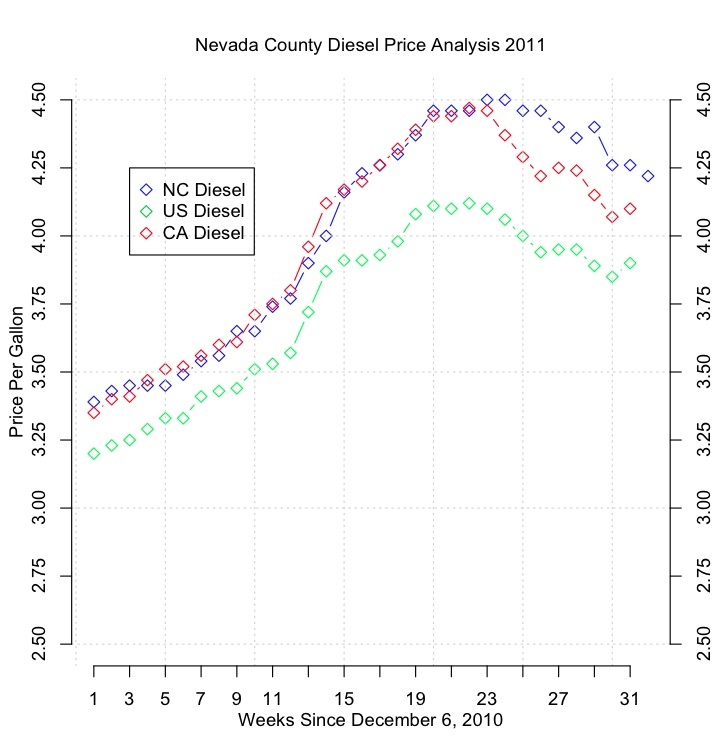 Diesel prices continue to decline, except in Nevada County. On the other hand the decline in gas prices seems to have leveled off with the price of crude oil creeping back up again.